This recipe makes a LOT of dip. We’re talking a TON. 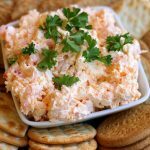 It’s perfect for a large party but if you’re hosting just a couple of people and want to serve this dip as an appetizer, I recommend cutting the recipe in half. We love to serve the dip with an assortment of crackers but it is also delicious on top of cold cucumber slices!